Lovelyz, who are promoting their refreshing charm with the title song from their 2nd album, 'WoW! 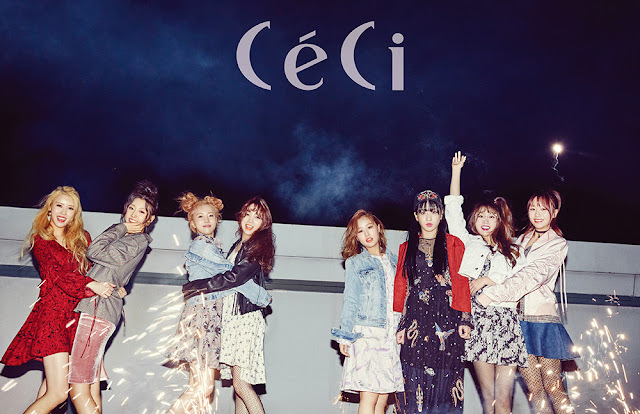 ', have revealed a new side of them through a pictorial with the fashion magazine, CéCi. Late at night, the Lovelyz members were focused in putting on a different charm from usual for the outdoor shoot. Even in the chilly weather, Lovelyz showed no signs of weariness, and the staff at the shooting site basked in Lovelyz's bright energy. On the question of 'My girl crush', various answers came out in the interview after the pictorial shoot. Having shown a stage of 'Atlantis Princess' on JTBC 'Girl Spirit', Kei, as always, answered, "I want to be like BoA-sunbaenim." Mijoo answered, "Lee Hyori-sunbaenim looks cool on stage, so I look up her videos all the time," showing her wish of personally watching her stage. Sujeong, as expected, confessed, "I've written a letter to IU-sunbaenim in the album." Meanwhile, Lovelyz (Baby Soul, Yoo Jiae, Seo Jisoo, Lee Mijoo, Kei, JIN, Ryu Sujeong, Jeong Yein) who came back with their 2nd album 'R U Ready?' are actively promoting with their new song 'WoW!'. You will be able to see Lovelyz's full pictorial and interview on the April issue of CéCi, while you can check out CéCi's SNS and homepage for their selfcam videos and articles. [+22 | -1] Both of them are so cute. One is promoting, the other is said to promote soon. Everyone, fighting! [+13 | -2] Lovelyz, I love you!!! I'll always support you! [+6 | -0] They suit casual clothes. I hope they can wear casual clothes later on stage.